In 1965, tax administration authorities from the countries of the Americas were invited to learn about and discuss in the United States of America the fundamental tax administration problems. On that occasion, Messrs. Sheldon Cohen and Harold Moss, Commissioner and Director of the International Assistance Service of the U.S. Internal Revenue Service, respectively, had the vision of creating an organization that could serve as permanent forum for considering the tax administration problems. Throughout the years, CIAT has endeavored to become a model of reference in the promotion of international tax cooperation, by coordinating joint activities with itsmember countries and related international organizations in the field of taxation. 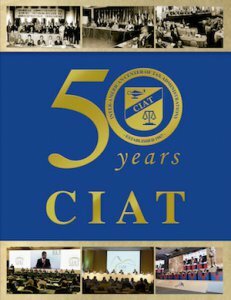 This publication is a special condensed edition of the history of the Inter-American Center of Tax Administrations – CIAT, in its mission of collaborating with the improvement of the tax administrations of its member countries, in particular, the promotion of international cooperation. The blue color represents the influence of Spain in the Western Hemisphere and the green color the Anglo-Saxon influence. The scale represents the equitable fairness of the tax administration and the lamp, understanding or knowledge, since the purpose of the Center is to disseminate information.